The 25th Anniversary of Chick Singer Night Saturday October 19,2013. We had over 12 Performers from over Atlanta taking stage to this Nationally Sponsored Event. 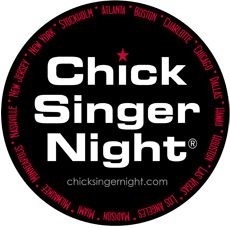 Many well Known Singers have Performed Chick Singer Night including Nora Jones, Sheryl Crow and Paula Cole. I performed a set of Three Songs with the CSN Live Band. That Night I Performed two original Songs along with a Cover Version of Stevie Wonders "As". Chick Singer Night has been expanding at a rapid pace in this millenia. Chick Singer Night is the world's most notable original and longest-running songfest for female artists. Gathering support from NAMM in 2004, and the producer project with Guitar Center bringing winning performers into world class recording studios, CSN has developed into a global presence.